For those of you who don’t know, we host a Meetup at Green Earth on the first Sunday of every month. By “we” I actually mean Vaalea (from Ireland). But since Neil and I bring an NCVA sign, the NCVA gets the credit and Neil and I get endless accolades (well, mostly from Greg) for our tireless organizing. Anyway, we had another one today. It was the usual fare. Brown and white rice (which I don’t touch), a couple of salads (which I hear are good but which I also don’t bother with), and about eighty pounds of fake meat at varying levels of fried-ness. This stuff and those heavenly little squares of cheesecake are where I focus my attention. It was a complete madhouse in there today – Very few empty tables and at least one other large group. A bit loud, but I was so pleased to see Green Earth doing such cracking business despite its unfortunate eschewal of alcohol. Plus the proprietors kept the food coming fast and furious so we certainly didn’t suffer from the business. There were many familiar faces, including local celebrities Joe Vegan and Alex the Carrot. 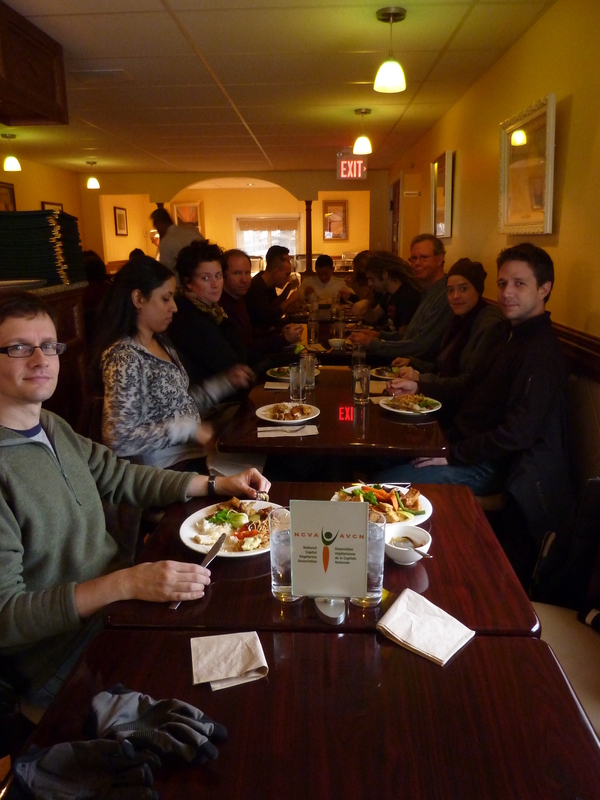 Several lovely first-timers as well, who I hope to see at our next potluck. Anyway, just a note to thank those who came out and to encourage those who didn’t to try to make the next one…East Africa Restaurant on Sunday December 19th at noon. The fake waterfalls alone are worth the trip! Previous PostUnscrambling the Mystery of the Perfect Tofu ScrambleNext PostVegan Cookies Take Over Jack Purcell Recreation Centre on December 11th!